Named after its writer, Daniel's book is a product of his time in Babylon as a Jewish exile from Israel. While still a young man, Daniel travelled to Babylon with a group of young Israelite nobles, men of promise whom the conquering power felt could be of use in service (Daniel 1:3–4). Once Daniel arrived, the leadership in Babylon renamed him Belteshazzar in an effort to more closely identify him with his new home (1:7). Daniel lived there throughout the Jews' 70-year captivity (1:21; 9:2), eventually rising to become one of only three administrators over the provincial governors throughout the kingdom (6:1). The Babylonians exiled the group containing Daniel and his three friends—best known by their Babylonian names, Shadrach, Meshach, and Abed-nego—to the cultural centre of the their empire, the city of Babylon, in 605 BC. This move was part of the first of three deportations (605, 597, and 586 BC) carried out by the Babylonians in Israel after they subdued Jerusalem and the unfaithful King Jehoiakim (2 Kings 23:36–24:2). The teenaged Daniel found himself in the midst of a strongly polytheistic religious culture, meaning he had ample opportunities to fall into error. However, he stood firm in his faith among the Babylonian people on several significant matters—including dietary regulations and worship practices (Daniel 1:8–16; 6:6–12). 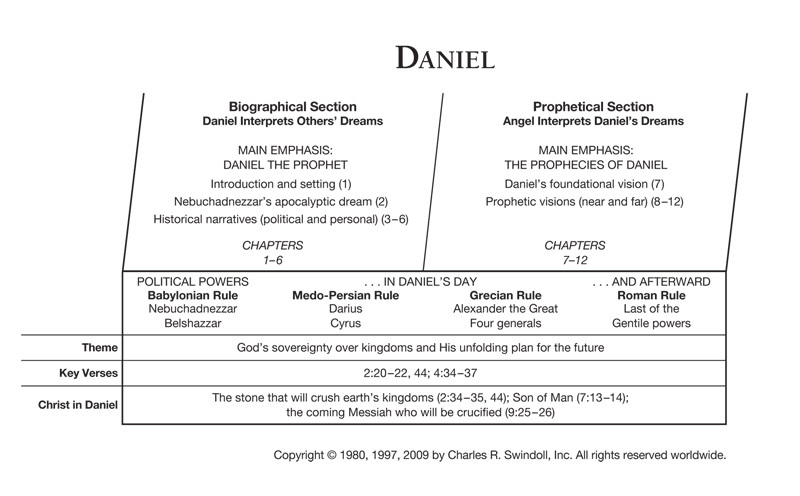 Find resources in the book of Daniel in our resource library.